Amanda Seyfried was spotted around LA wearing a very casual outfit but carrying a very trendy bag which kept her look from looking grungy and made her look like the celeb she is instead. The bag on her arm follows the latest trend from designer bags – no visible logo. The sides are dark brown suede, the front panels are brown leather and the base is grey. Maybe people grew tired of the less than subtle LV bags seen on the likes of Paris Hilton. We’re liking the look of logo-less bags. They look just as stylish and expensive as monogrammed bags but give the message that the wearer is so fabulous they don’t need to remind people how well they’re doing. The shape, color, materials and gold touch do all the talking. 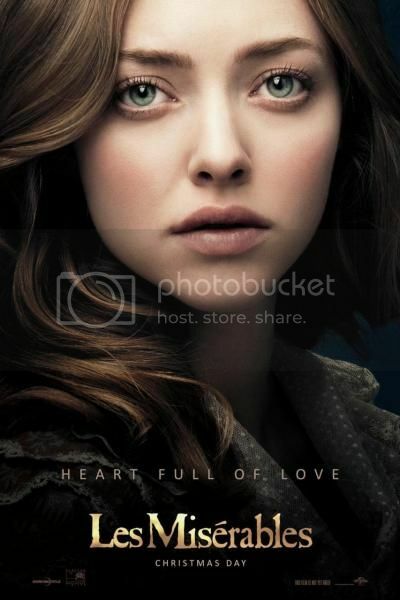 Here she is in the promo poster for her latest film Les Miserables, which has been making waves since before it even started filming. This one’s gonna be big!